The end of the "Flat-Nose" : In 1987, the major styling change was the new sloping nose with a new front grille, new headlamps and so-called "integrated" bumpers font and rear with integrated spoiler on the front bumper. All Saab 900's except the basic Saab 900 model, were given that new front end which improved the aerodynamics by 5%, new bumpers front and rear which were slimmer and 33% lighter but offered more protection than their predecessors. The sheet metal was unchanged. Adjustable heating of the drivers seat was introduced for the Saab 900 Turbo and the Saab 900 T8 had oil-filled engine mounts like the ones in the Saab 900 T16. Servo assisted steering became standard on the Saab 900i as did a new centre console inside. A catalytic converter was now fitted to the exhaust system as standard for most markets including Sweden. All the Saabs sold on North American market had them since 1976. 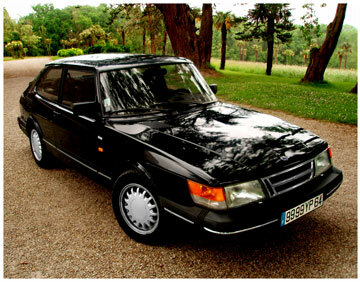 The superb Saab 900 Convertible went on sale in all existing markets with a 175hp engine. Interestingly, the first 400 Saab convertibles were "flat nose" front 1986 models. All of them were sold in the US. Saab 900 1988 : The turbo unit in the Saab 900 was now water-cooled, for the first time, to ensure greater operational reliability and longer life expectancy. A new braking system with vented discs at the front. The handbrake now acted upon the rear wheels. New wheel hubs with bolts, same as the 9000 where introduced. External changes were matt black window strips, handles, decor plate and tinted windows on the 900i. The Saab 900 Convertible was being assembled at the rate of 20 a day at the Nystad plant in Finland. 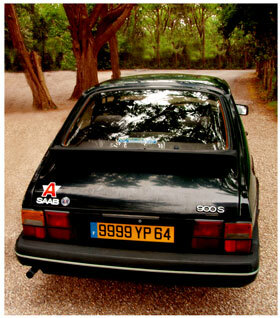 Saab 900 1989 : Saab's climate-adjustable exhaust cleaning system was introduced. The eight valve turbo engine was phased out during the 1989 Saab 900 model year, all turbos acquired the 16-valve engine. The same 16-valve unit, less the turbo, powered the Saab 900i delivering 126hp or 130hp depending on whether a catalytic coverter was fitted or not. The carburettor engine was also phased out. Another safety innovation the high-level third brakelight was mandatory for all U.S models and was fitted as standard on models in other markets where it was not prohibited. ABS (Anti-lock Braking System) brakes became standard on the Saab turbo and was available as an option on other models. 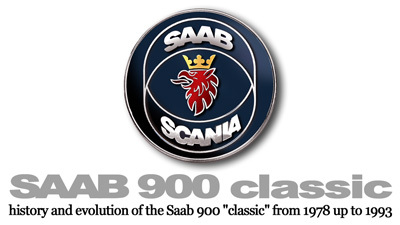 The 10,000th Saab 900 convertible was assembled this year. Saab 900 1991 : All Saab 900 model were now only equipped with 16 valve engines. A 2.1 litre 140hp injection engine was introduced in some markets. This year saw an entirely new version of the Saab 900 Turbo 16S Convertible called the "Aero" in some markets : It was a Saab 900 Convertible equipped with factory mounted body panels and Aero wheels. The same design as the three-door Saab 900 Turbo 16S Aero. The Convertible version was introduced with a 128hp injection engine. The Saab 900 had a new air filter. The Saab 900 now had the same seats as the Saab 9000. An electrically adjustable drivers seat was made available. The back seat belt attachments were moved upwards 52mm in the three-door Saab 900. This made them more comfortable as well as safer. The new position further decreased the risk of the passenger "twisting" out of the belts' grip in a collision. The headlight wiper-washers that Saab invented back in 1971 were made 10% more efficient. Saab 900 1992 : In the Nordic markets Saab-Scania introduced the 2.1 litres engine (2,119cc), a fuel-injected engine developing 140hp. All Saab 900's were provided with more basic equipment. Anti-lock brakes became standard on all Saab 900's, there was also an airbag available. This year saw the assembly of the 40,000th Saab 900 Convertible. For comfort, a new electrostatic compartment air filter was fitted. The Saab 900 now had the same front seats as the 9000 with the option of an electrically-adjustable drivers seat.